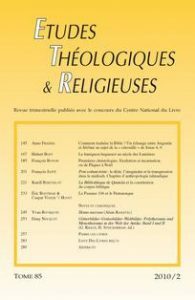 Cet article est la version française d’un original paru en anglais sous le titre « The First Christologies : Exaltation and Incarnation. Or, From Easter to Christmas », in Jesus Christ Today: Studies of Christology in Various Contexts. Proceedings of the Académie Internationale des Sciences Religieuses, Oxford 25-29 August 2006/Princeton 25-30 August 2007, Stuart George Hall, éd., Berlin/New York, Walter de Gruyter, coll. « Theologische Bibliothek Töpelmann 146 », 2009, p. 27-43. Published with permission of Walter de Gruyter GmbH & Co. KG. Among the various early Christian communities the best known are those of Jerusalem and Antioch. François Bovon’s investigation into their witnesses leads to a twofold proposal: while the Jerusalem community affirmed the Easter exaltation of Jesus the Crucified, the Antiochian community announced the incarnation of the preexistent Son.